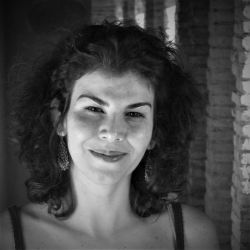 Mouna Karray currently lives and works between Paris (France) and Sfax (Tunisia), where was born. Karray studied cinema and photography in Tunisia (1989-1993) and received an MA specialising in photography in Tokyo (1997-2002). Karray’s works primarily in photography and sound installation (and often makes use of video work). Her art merges socio-political themes with personal experience to explore constructions of identity and memory. 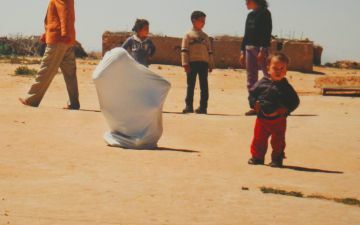 Her photographic body of work Nobody Will Talk About Us, featured in Zeitz MOCAA’s inaugural exhibition at the Centre for Photography, was taken across various landscapes of the Tunisian south, in which a figure is presented shrouded in a white sheet. Photographed against rural, desolate backdrops depleted of their mineral resources, this body of work represents a series of narratives, exploring her encounters with both the people and landscape of a region that serves as home for the more neglected of the country’s population. The anonymous subject, wrapped in a white sheet softens the harsh reality, subliminally bringing attention to the forgotten people. The photo series Noir also featured in the Centre for Photography, evokes solitary feelings similar to Nobody Will Talk About Us. In Noir, the artist’s body is wrapped in a white sheet. With one hand visible, she clutches the remote shutter-release of the camera. It is an image of confinement and inhibition. At the same time, the photographer’s hand speaks to the potential agency of creativity within situations of repression. The remote – easily mistaken for a hand grenade – could also be suggestive of violence, agency, and a will toward liberation. Notable exhibitions include Dak’Art, the 12th Biennale of Contemporary African Art (Dakar, Senegal: 2016); and The Divine Comedy: Heaven, Purgatory and Hell Revisited by Contemporary African Artists, a touring exhibition curated by Simon Njami (Smithsonian Institute, Washington, DC, USA:2015; SCAD Museum of Art, Georgia, USA: 2014-15; and MMK Museum für Moderne Kunst, Frankfurt, Germany: 2014).